Once a powerful mage, and a councilor to Queen Azshara, Xavius forged a pact with Sargeras to enable the Legion's first invasion of Azeroth. Cursed and tormented in the wake of that defeat, Xavius plots vengeance against the world from within the Rift of Aln. Those who venture into the Nightmare will face the full extent of his power, and his true form - a grotesque and distended monstrosity. This fight is taking place on a circle platform surrounded by a mist. It is divided in 3 phases in which each phase has its own certain mechanics that does dmg and gives you corruption. During the fight you will get corruption on you (A bar from 0-100). After certain amount of corruption, you see things that will harm you (no one else will see it). After 100 corruption, your dps/heal will be increased by 150% for 20 seconds, then you will get Mind Controlled and others have to kill you. During the fight you will also enter a Dream phase in which you will be on the same platform and attacking boss/mobs. You are in the dream world for a reason. 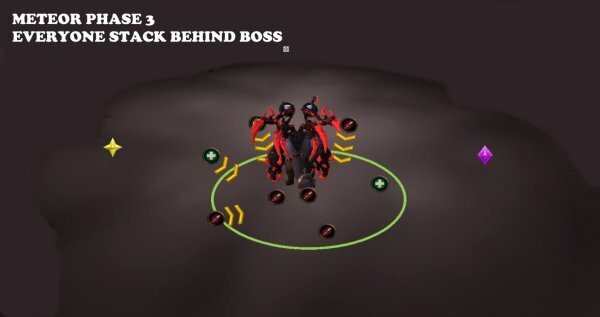 Handle mechanics that gives corruption and burst out all healing and dps that you can since it resets when you come out from the dream phase. The fight is about balancing your corruption by avoiding most things in the real world and handle them in the dream world because your corruption will be reset when you come out from the dream world. In the last phase, no one can enter the Dream World which means that you will get more corruption on you since it will not reset. This phase is all about nuking the boss as fast as possible and some players will get 100% corruption which means that they will also get 150% increased dmg/heal for 20 sec. But also means that they need to be killed when mind controlled. Many of Xavius abilities does Corruption on the players. You will have a corruption bar (0-100) during the fight. 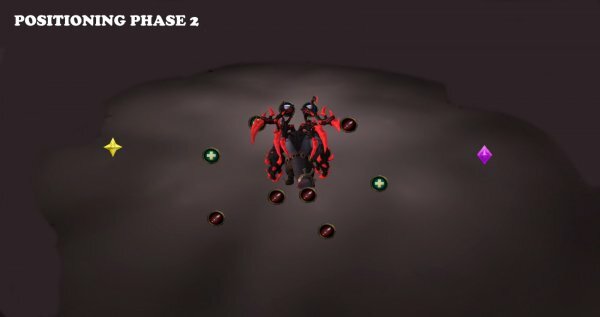 An add (Dread Abomination) will spawn from the mist and smash his limbs on the encounter platform (Big circles will spawn on the ground before impact). Shadow balls will land on random locations on the platform (small circles will spawn on the ground before impact). Getting hit does damage and adds 5 extra corruption. You will get 150% extra damage and healing boost for 20 seconds. Then you will mind controlled and attack allies until killed. This will most likely happen to some players at the end of the fight. Nuke the boss with all you got during these 20 seconds before you get mind controlled. Other players need to kill Mind controlled players. Ranged in middle and spread at least 6 yd. from each other. When dispelled, it does high damage to all players within 15 yd. radius. The dispeller gets 25 Corruption and Shadow dmg. Tank swap at 3 debuffs. When having 3 debuffs, move away from raid (to the side) and wait for a dispel, then move back again. Dispel the Debuff when a tank has 3 stacks and standing on the side, away from raid. Do NOT dispel the tank. 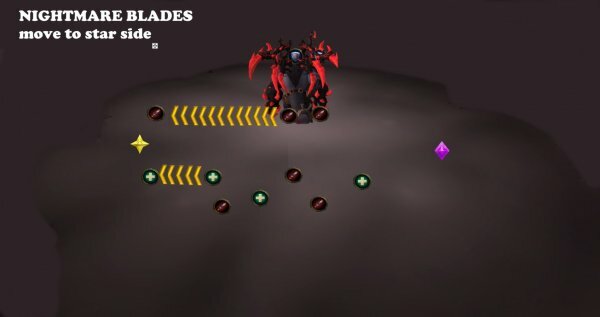 A wall of blades erupts from the ground, doing high physical dmg to anyone in the area and does knockback. This damage ignores armor. Two players will be marked with an arrow on their head. This blade will shoot through 2 these two players. Both players run to the left side of the platform in a line towards north so the blade hits vertically not horizontal. When Xavius reaches 100 Energy, adds will spawn. Xavius reach 100 energy every 20 seconds in phase 1 and summons 1 of 2 types off adds. The creation of the add does Shadow damage to all players in 150 yd. radius. Does Shadow dmg and 5 Corruption to nearby players. Frontal cone (high shadow dmg) and 10 corrption. Move away when the add spawns. The other tank: Pick up the Horror add and position the add next to boss facing away from raid. 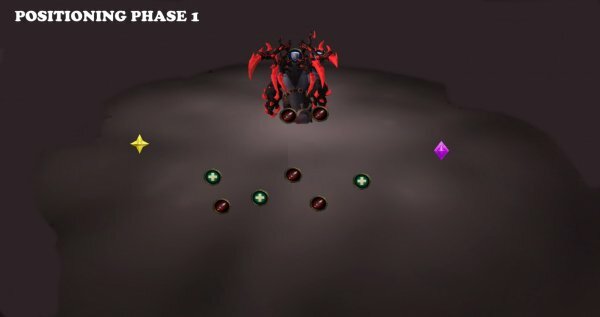 At 2 stacks of Darkening Soul, swap boss/add. Focus on corruption add and kill before moving on to boss again. An add (Lurking Terror) is created under a random player´s location. Does Shadow dmg to all players in a 6 yd. radius. Does high shadow dmg and 20 Corruption when reaching ANY player. These adds are immune to dmg. Stand spread from each other atleast 6 yd. Targeted ranged in real world: Run away to the side and kite. Targeted ranged in Dream: Get hit by it. Stay away from the Lurking add. Any player in dream world touch the add fast. At 95% Health, half of the raid will be put into a Dream state with the help of Ysera. When you die or get 100 Corrruption you will come back to the real world. Your Corruption will reset to the level you had before entering the Dream. Your health and mana will reset. Dispel the Debuff when a tank has 2 stacks and standing on the side, away from raid. Run into a lurking add when you see one to soak it. Pop your personal cooldowns since they will reset when you come out. This phase starts when Xavius has 65% health. Ranged spread around the boss. Puts a debuff on tank that does shadow dmg every 1 sec until dispelled. When dispelled it increase physical dmg taken by 150% on the tank (Blackened). The dispeller gets 25 Corruption and shadow dmg (Blackened Tainting). Tank swap after 6 stacks of Blackening Soul. Run away from raid and wait until you get dispelled, a pool will spawn under you, run back to boss. The pool that is spawned under tank when dispelled needs to be soaked or a Horror add will spawn. A meteor lands on a random player. Does overkill dmg and 40 Corruption. The dmg and corruption is split between players inside the impact. Targeted player and everyone else in the Dream World stack on the right side of boss. Melee attacks that Xavius does is empowered that spreads 5 corruption on the tank for 30 sec. Xavius reach 100 energy every 40 seconds in phase 2 and summons a specific add in which the amount of that add is based on amount of players. When the add reaches Xavius, it will buff him with energy so he does Shadow dmg and 1 Corruption to all players every 5 sec. When the add dies, he leaves a pool of corruption that does Shadow dmg and 2 Corruption ever 1 sec if a player is standing on the pool. The pool is removed when players are standing on the pool. If no players are standing on the pool, it will reform to an Inconceivable Horror add after 15 seconds. 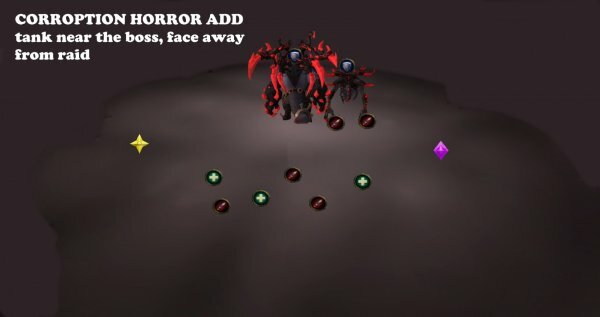 The number of Horrors is based on raid size. Focus target the add(s) and kill them fast. One player in Dream world stands on the pool after the add dies and stays on the pool until it is gone. It goes fast to remove it. At 60% Health, the other half of the raid will be put into a Dream state with the help of Ysera. When you die or get 100 Corruption you will come back to the real world. Dispel the Blackening Soul on tank after 6 stacks and tank has moved away from raid. Taunt the boss when Tank in Real world has 6 stacks of Blackening Soul. 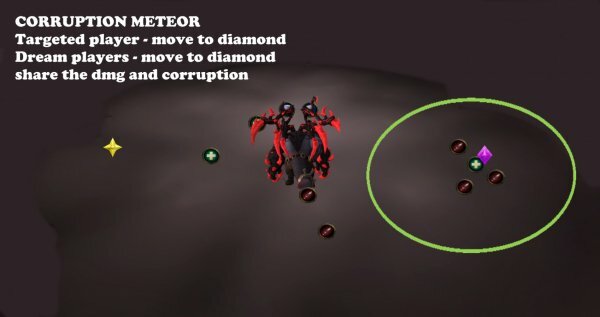 Stack on the Meteor fast to share the damage and Corruption. Nuke the Horror add asap, stun, slow etc so it doesn’t reach boss. 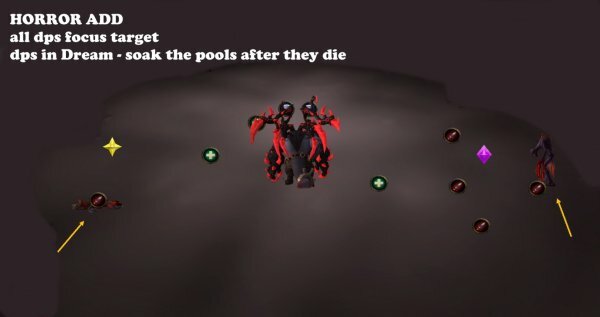 Stand on the Pool that is created after the Corruption add dies. Stand there until the pool is gone. This phase starts when Xavius reaches 30% health. Dispel the debuff on tank after 6 stacks. Preferably healer with lowest corruption dispels. Without the help of an add, Xavius now buff himself and does 5 corruption on the player with his melee attacks for 30 sec. Xavius reach 100 energy every 20 seconds in phase 3 and summons tentacles. Xavius summons tentacles around the area. The tentacles throw energy bolts on random players that does shadow dmg and 3 Corruption. Move boss to tentacles for cleave dmg.